The most recent bill to pass in Oregon illustrates the state of our nation’s health. As a nation we are morally spent. We have people advocating for infanticide, advocating for putting “down” those which cost too much to cure under the guise of “assisted suicide” and now advocating to expedite death of the mentally ill by starvation. A slow and torturous death. When reading these changes to the HB 4135 bill amending the Advance Directive laws already in place it seems benign at first glance. Evil always hides in plain sight and always under the guise of “greater good” or mercy. A man testified for this bill to pass describing his loss when petitioning the courts in Oregon to allow him to cease giving food to his wife so that she may starve and ultimately die. His wife suffers from dementia. Someone who suffers from dementia or Alzheimer’s feels pain, confusion and entrapment. They seem to be trapped in cyclic thoughts or memories deteriorating day by day until their brain can no longer function to sustain life. It is, in actual fact, slow brain death. 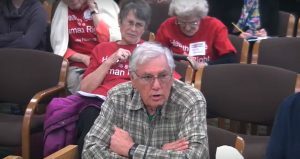 Oregon has set the tone for making a slow and torturous death like starvation legal. This should concern everyone as Dementia / Alzheimer’s is just two of many “brain deterioration” deaths that are demonstrated but this bill applies to all that are mentally ill and or incapacitated to communicate. Air, Water, Food and Shelter. The basic necessities of life. No matter how mentally ill you are you will feel pain and fear if you cannot breathe. No matter how mentally ill you are, you will feel thirst and die a painful death if you do not have water. No matter how mentally ill you are, you will feel hunger and die a slow agonizing painful death if you do not have food. No matter how mentally ill you are, without shelter you will be exposed to the elements and succumb to environmental factors at some point. We cannot bear the site of an animal starving but it’s ok for a mentally ill patient? How many people are currently in the custody of caregivers in the state of Oregon that suffer from mental disorders? There are hundreds of thousands of persons that suffer from psychotic disorders, like schizophrenia, Multiple Personality Disorders, Severe Depression, Extreme Bipolar disorders, PTSD, and many more that are permanent and so severe that they require round the clock care and are deemed incapable of making their own decisions due to lack of faculties. What about those with violent autism etc.? This law allows their legal guardian, their caregiver, or doctor to withhold food and or water so that they may die. Are you getting it now? Years ago I watched a documentary. “Children of Darkness” which is an Oscar nominated 1983 documentary film produced and written by Richard Kotuk and Ara Chekmayan. It explored the topic of juvenile psychiatry – an acute lack of mental health care in America for seriously emotionally disturbed youth. I have embedded it below if you wish to watch it. It’s very disturbing but very thought provoking. Psychiatric and mental disorders are VERY personal and anthropocentric to the individual. I believe that those that are mentally ill and disabled are the most vulnerable demographic in any society and it is our obligation as human beings to care, make them comfortable, but also try to understand possible remedies and solutions for such ailments. This BILL is profoundly one of the most HORRIFIC and IMMORAL pieces of legislation passed in modern history as it opens the floodgates to give full and ultimate control with NO OVERSIGHT of terminating life of a vulnerable human being. Abortion and Infanticide are just as horrific but this bill is even more horrendous because they are acknowledged as people, living and breathing- free under the eyes of GOD and that the state of Oregon with the passage of this bill has deemed less than human. President Trump understands the state of health of our nation. We are morally spent, conditioned to throw all basic unwritten moral laws out the window because we have no objective perspective. Instead, many have a collective subjective – one that is amplified through hive mind social conditioning. President Trump is a genius in the way he chose to remedy this. A battle to free the spirit and thought of a man or woman who has been subject to subtle social conditioning over time, is one you will lose if tackled head on. Hence, the only way a person holds an objective perspective is with independence and sense of self-accomplishment. President Trump revived the economy so that every man and woman in this nation has the opportunity to feel accomplished. That way, every citizen can have a job, work hard, and bring home the bacon. To buy that new flat screen TV or latest phone proudly with money they earned. He removed the stigma imposed by our SOCIAL CONDITIONING that to be successful, you need a 9-5 job in a cubicle and a degree. He is rebuilding America by empowering the people to prosper, feel proud, independent and remind them there is no shame in WORK. As an empowered citizen with control of your nation’s direction by having your voice heard and with the ability to control your growth and prosperity you are able to objectively perceive events from your purview not the mainstream or “greater good” view. When you are INDEPENDENT from the government or society for your existence and or life you are truly independent. Look no further than those advocating to remove our rights to innate freedoms like speech, arms, competition and choice – they are all dependent on some faction of the government or society for approval. Observe their responses to questions and how they look to others for approval almost terrified of social condemnation if their perspective is not widely acceptable. That is how a slave feels when their master asks them their opinion, and in the same way that is a how a victim looks at their abuser. Political Correctness and lack of independence in all facets of one’s life is the source of this epidemic of moral corruptness. “Trust your gut”. Did you know that your “gut” has its own separate neuronal circuit? It’s almost autonomous. We still don’t know how it works, but it gives us butterflies or makes us sick indicating emotional responsiveness in specific situations even though it’s “independent” from the Central Nervous System. What does your gut tell you about this bill? Personally, it made me sick. This BILL is a CLEAR indicator of how the fabric of our society in the United States of America is morally corrupt and should be a wake up call for all to see what is really at stake here. It was discussed in 2017 and failed I guess after the 2018 elections it came back stronger. Below is an excerpt of the pro arguments back in 2017 as reported by USA TODAY making starvation seem compassionate! Advance directives are legal documents that spell out a person’s end-of-life wishes if they are unable to make their own decisions. These directives generally allow named agents the power to withdraw artificial hydration and nutrition in the form of feeding tubes, for instance. But when that same nourishment is offered by hand, several states, including Oregon, draw a line, said Thaddeus Mason Pope, director of the Health Law Institute at Hamline University in St. Paul, and an expert on end-of-life law. The Governor of Oregon must sign this bill into law, and if it does goes through, is it not our obligation to advocate for all those vulnerable people that will cease to exist because of it? Starvation is an atrocious way to die. It’s slow and painful – very INHUMANE. How many animal videos have you seen with animals being starved? Humans being starved? Children? Do they not make your heart break? Then how is this LEGAL in our country? Please say it ain’t so.